FISH OR NUTS? California's iconic king salmon is competing for water resources with Central Valley almond farmers and other agricultural interests. Salmon's legacy for Californians goes far beyond its estimated $1.4 billion fishery or its classification as one of the most nutritious foods in the world: the fish also provide a vital transfer of nutrients and energy from the ocean back to the freshwater ecosystems where they were born. "People have done studies to show that you can identify ocean-derived nutrients from salmon in many dozens of different species, like kingfishers or water ouzels, fish-eating ducks, foxes, raccoons, coyotes—all the way up to the big predators that used to live here but are gone, like grizzly bears," says Nate Mantua, a research scientist for the National Oceanic and Atmospheric Administration's (NOAA) Southwest Fisheries Science Center in Santa Cruz. Accumulating 95 percent of their biomass at sea, adult Pacific salmon die after they spawn, and their nutrient-rich carcasses, gametes (mature eggs and sperm) and metabolical waste return to the land. "It's fascinating that, over the eons, a lot of fertilizer was provided by these dead salmon, so a lot of the wine grapes and a lot of the agriculture inland by the rivers was fertilized by salmon for a long time," says Randy Repass of the Golden Gate Salmon Association (GGSA), a coalition of salmon advocates based in Petaluma. 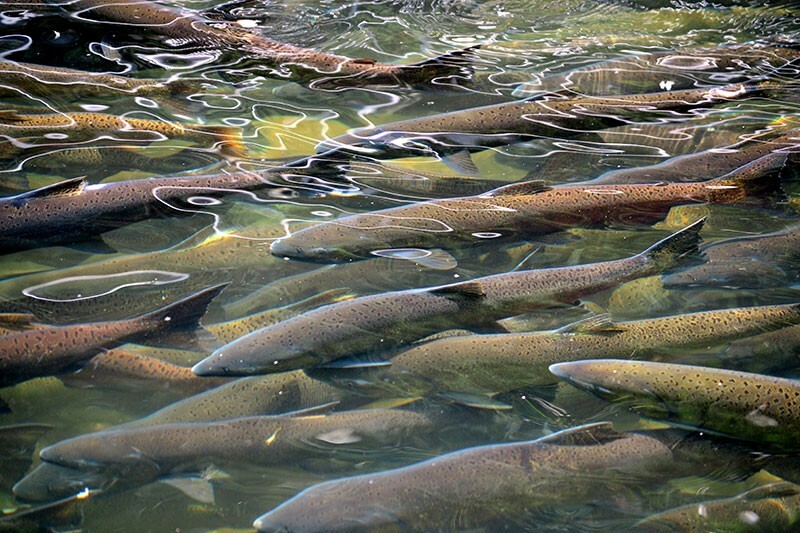 Salmon's yearly return props up an entire food web, replenishing bacteria and algae, bugs and small fish, and fueling plant growth with deposits of nitrogen and phosphorus. The Chinook (aka king), the largest salmon species (adults often exceed 40 pounds and are capable of growing to 120 pounds), is the pride and joy of California's salmon fishery. Not so long ago, the Central Valley watershed was one of the biggest producers of naturally breeding Chinook salmon in the world, second only to the Columbia River, with the Klamath River another big California contributor. Driven by the Sacramento and San Joaquin river systems, the Central Valley nursed a ballpark average of a few million salmon per year, emerging each spring out of the Sacramento-San Joaquin Delta, says Mantua. "Today, natural production—maybe in a good year—is in the hundred thousand or hundreds of thousands," Mantua says. "So, yeah, it's a few percent of the historical population." Development in the 1940s through '60s, and especially the constructions of dams like the Shasta Dam, built in 1943 on the Sacramento River, played a key role in the near annihilation of the long-standing fish stock. "When they built the big dams in California, they basically blocked off access to 80 or 90 percent of the habitat salmon historically used to reproduce in California," says John McManus, executive director of the GGSA. California's four salmon runs—fall, late-fall, winter and spring—are named for the time of year the fish return from the open ocean as adults, after about two to five years spent feasting on smaller fish and krill at sea, and back under the Golden Gate Bridge to the Sacramento-San Joaquin Delta. As of 1989, the winter run had joined the ranks of 130 other endangered and threatened marine species when it was listed as an endangered species under the Federal Endangered Species Act. Ten years later, the spring run was listed as threatened.